It is the “new territory” of oncology: Getting the immune system to successfully fight a standing cancer. No other biological system within our bodies is more suited, adept or evolved to such a purpose. Indeed, our immune system is remarkably successful in spotting and destroying the tiny genetic mutations from which a tumor arises. The ability of cancer, any cancer, to go unnoticed by the body is one trait which what makes it so formidable and unique a disease type. Unfortunately, the goal of totally reorienting the immune system in any way is still unrealized. But that is not to say science has not come very close. Indeed, it is getting closer. June is Cancer Immunotherapy Awareness Month. And the National Foundation for Cancer Research (NFCR) is excited to be offering this blog post—a deeper dive into this equally exciting tumor treatment category, still only in its adolescence. 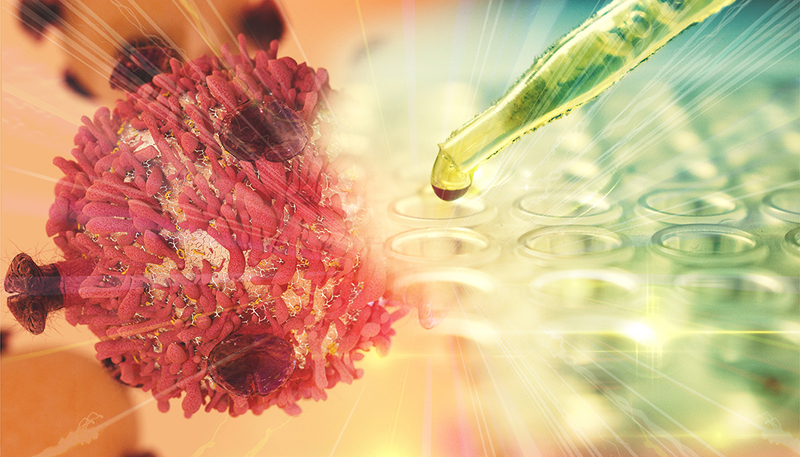 Let’s look at differing elements of immunotherapy. A diverse group, monoclonal antibodies, also known as MABs, work by attaching themselves to cancer cells, thereby making it easier for the patient’s body to recognize them as hostile. One type of MABs, called checkpoint inhibitors, block the proteins cancer produces which, otherwise, “inhibit” a desired immune response. They are already used to treat some melanomas and lung cancers. Still other MABs prevent cancer cells from dividing. Perhaps the most famous cytokine is interferon. At its most basic, interferons are naturally occurring proteins made by the cells of the immune system. While they do not directly kill cancerous cells, interferons do modulate how the immune system responds to a threat, cancer or otherwise. However, scientists have since manufactured interferons using recombinant DNA as cancer therapies, such as interferon alfa-2a (also known as Roferon-A), which is used to treat hairy cell leukemia, HIV/AIDS-related Kaposi sarcoma, and chronic myelogenous leukemia. Another type of cytokine is aldesleukin, used most often in attacking kidney cancer. A relatively new idea, a cancer vaccine works along the same lines as vaccines for smallpox or the flu, the idea behind a cancer vaccine is to “fool” a patient’s immune system into thinking it is suffering a malignancy—even though, in the case of “preventive” vaccines it may not be, versus “therapeutic” vaccines, where it is. The result is the creation of antibodies capable of staving off cancer before it has a chance to take root, or to stop a cancer already underway, or to destroy any cancer cells remaining after another form of treatment. Still very new, the most promising adoptive cell transfer technology, CAR T-cell therapy, is a process by which a patient’s T-cells, also called “killer” T-cells, are harvested and genetically engineered in order to better seek and destroy cancer that has so far eluded detection. These man-made T-cells can persist in the body for years, guarding against cancer’s return. The idea of injecting a virus into an already sick patient can be unsettling, but this type of immunotherapy is already being used to treat melanoma, the most virulent form of skin cancer. A genetically modified virus is put into a tumor, where it invades the constituent cells and begins to make copies of itself, causing the infected cell to eventually burst and die. As those cells die, they release antigens that a patient’s immune system recognizes and then creates antibodies targeting all cells with those same antigens. The virus does not harm the patient. Short for Bacillus Calmette-Guérin, this technology is currently used to treat bladder cancer. Similar in idea to oncolytic virus therapy, this technology uses a bacterium instead of a virus. A weakened form of the same bacteria that causes tuberculosis is inserted into the bladder, causing an immune response against the cancer cells. This process is being studied for other cancers as well. All these therapies are administered in familiar ways, such as orally, topically, intravenously, or via the bladder, a process called intravesical. As a field, immunotherapy still qualifies as an emerging science, trailing well behind the conventional cancer treatments of surgery, chemotherapy and radiation. At the same time, several immunotherapies have moved out of clinical trials and are open to the public, while other immunotherapies are already in clinical trials. Multiple NFCR-funded fellows are performing research on the cutting edge of the immunotherapy categories introduced above. For example, Wayne Marasco, M.D., Ph.D., is recognized as a world-leader in the field of monoclonal antibodies, and his efforts hold great promise for the treatment of renal cell carcinoma, the most common type of kidney cancer, and other tumor types. Cytokine and viral cancer therapies both are associated with few scientists whose laboratories offer as much promise as do those of Paul Fisher, M.Ph., Ph.D. Other recent examples include CAR-T expert, Laurence Cooper, M.D., Ph.D. This is the field of immunotherapy. And with our understanding of genetics and genetic engineering growing in leaps and bounds every day, it is a field generating tremendous hope for cancer treatments. With justification—and NFCR support!